Emphasis on open-ended research and in-depth study using primary and secondary sources (no text books or worksheets) as well as other materials. 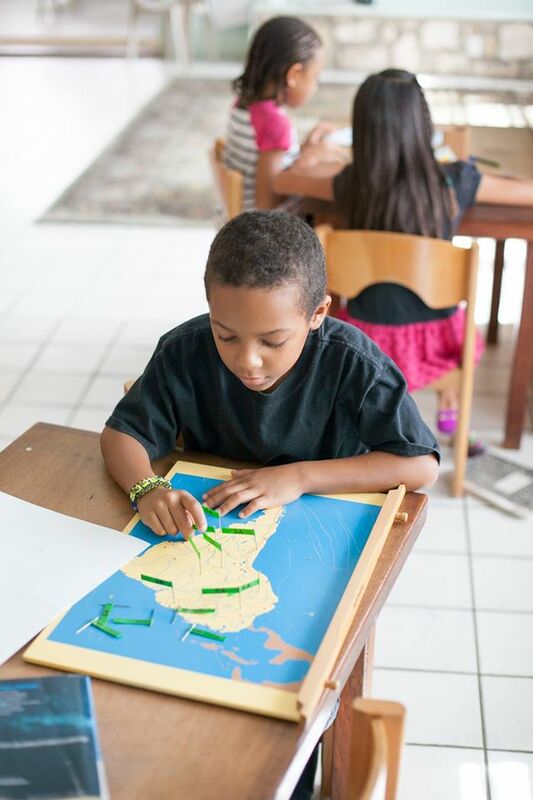 As in the Primary, the Montessori Elementary materials are a means to an end. They are intended to evoke the imagination, to aid abstraction, to generate a worldview about the human task and purpose. The child works within a philosophical system asking questions about the origins of the universe, the nature of life, people and their differences, and so on. On a factual basis, interdisciplinary studies combine geological, biological, and anthropological science in the study of natural history and world ecology. The program is made up of connective narratives that provide an inspiring overview as the organizing, integrating “Great Lessons.” Great Lessons span the history of the universe from the big bang theory of the origin of the solar system, earth, and life forms to the emergence of human cultures and the rise of civilization. Aided by impressionistic charts and timelines, the child’s study of detail in reference to the Great Lessons leads to awe and respect for the totality of knowledge. Studies are integrated not only in terms of subject matter but in terms of moral learning as well, resulting in appreciation and respect for life, moral empathy, and a fundamental belief in progress, the contribution of the individual, the universality of the human condition, and the meaning of true justice.